Data from Deep Impact's instruments indicate an immense cloud of fine powdery material was released when the probe slammed into the nucleus of comet Tempel 1 at 6.3 miles per second. The cloud indicated the comet is covered in the powdery stuff. The Deep Impact science team continues to wade through gigabytes of data collected during the July 4 encounter with the 3-mile-wide by 7-mile-long comet. "The major surprise was the opacity of the plume the impactor created and the light it gave off," said Deep Impact Principal Investigator Dr. Michael A'Hearn of the University of Maryland, College Park. "That suggests the dust excavated from the comet's surface was extremely fine, more like talcum powder than beach sand. And the surface is definitely not what most people think of when they think of comets -- an ice cube." How can a comet hurtling through our solar system be made of a substance with less strength than snow or even talcum powder? "You have to think of it in the context of its environment," said Pete Schultz, Deep Impact scientist from Brown University, Providence, R.I. "This city-sized object is floating around in a vacuum. The only time it gets bothered is when the sun cooks it a little or someone slams an 820-pound wakeup call at it at 23,000 miles per hour." The data review process is not overlooking a single frame of approximately 4,500 images from the spacecraft's three imaging cameras taken during the encounter. "We are looking at everything from the last moments of the impactor to the final look-back images taken hours later, and everything in between," added A'Hearn. "Watching the last moments of the impactor's life is remarkable. We can pick up such fine surface detail that objects that are only four meters in diameter can be made out. That is nearly a factor of 10 better than any previous comet mission." The final moments of the impactor's life are important, because they set the stage for all subsequent scientific findings. Knowing the location and angle the impactor slammed into the comet's surface is the best place to start. Engineers have established the impactor took two not unexpected coma particle hits prior to impact. The impacts slewed the spacecraft's camera for a few moments before the attitude control system could get it back on track. The penetrator hit at an approximately 25 degree oblique angle relative to the comet's surface. That's when the fireworks began. The fireball of vaporized impactor and comet material shot skyward. It expanded rapidly above the impact site at approximately 3.1 miles per second, and the crater was just beginning to form. Scientists are still analyzing the data to determine the exact size of the crater. Scientists say the crater was at the large end of original expectations, which was from 50 to 250 meters. Expectations for Deep Impact's flyby spacecraft were exceeded during its close brush with the comet. The craft is more than 2.2 million miles from Tempel 1 and opening the distance at approximately 23,000 mph. The flyby spacecraft is undergoing a thorough checkout, and all systems appear to be in excellent operating condition. 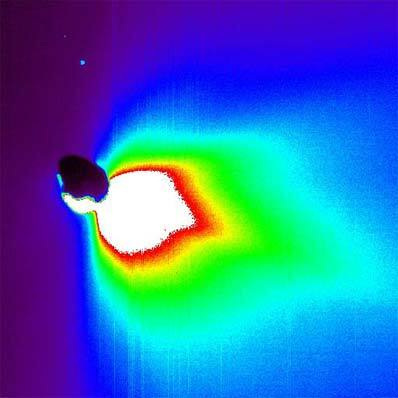 The Deep Impact mission was implemented to provide a glimpse beneath the surface of a comet, where material from the solar system's formation remains relatively unchanged. Mission scientists hoped the project would answer basic questions about the formation of the solar system by providing an in-depth picture of the nature and composition of comets. The University of Maryland is responsible for overall Deep Impact mission science, and project management is handled by JPL. The spacecraft was built for NASA by Ball Aerospace & Technologies Corporation, Boulder, Colo.